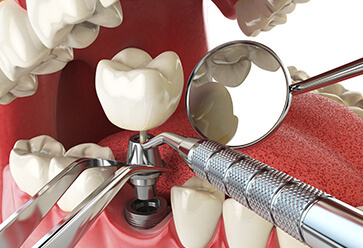 Specifically designed to aid in the replacement of missing teeth, while also delivering a reliable anchor for more elaborate dental prosthesis, dental implants can help our patients gain confidence in their appearance, as well as improve function. Thanks to our 15 years of personalised and comprehensive experience the team of dental specialists can enhance the visual appeal and chewing ability of your mouth. Using the latest techniques and durable materials our methods reduce the likelihood of infections and increase the chances of successful integration into your mouth. At Karingal Drive Dental we are passionate about making your dental implants as painless as possible. Langwarrin, Frankston, and other patients can breathe easy knowing that we can accurately and swiftly install implants into their mouths. Once the implant has healed our skilled surgeons can then place individual teeth, crowns, and larger prosthetics with ease. To learn more about our dental implant process please feel free to call our clinic today.